Dr. Katarzyna Rycerz, T. Guggemos M.Sc., M. Höb M.Sc. Welcome to the course webpage Introduction to Quantum Computing for winter-term 2018/19 at LMU Munich. This course will be held in English! Das Nachrückverfahren der Veranstaltung ist abgeschlossen und alle Plätze sind belegt. Welcome to the course webpage Quantum Computing for winter-term 2018/19 at LMU Munich. Registration will be opened the 6th of August in UniWorx. Important: The course will be held as a blocked course from 08.10.2018 - 12.10.2017. Two scientific revolutions embossed the first half of the 20th century. First, pioneers like Konrad Zuse, Alan Turing and John von Neumann developed the principles for the first useful computers. On the other hand, the theories on quantum mechanics shattered the world of classical physics, which hasn't been significantly changed since the days of Isaac Newton. While computers are ubiqutious in the modern world and changed our society in many ways, the impact of quantum mechanics is less obvious but equally important. Without the quantum mechanic description of atoms, semiconductors and lasers would not be possible. Modern technologies like CD/DVD players or computer hardware rely on this technology. In the last decades, both scientific disciplines have been slowly merged together, forming a new discipline called Quantum Computing. 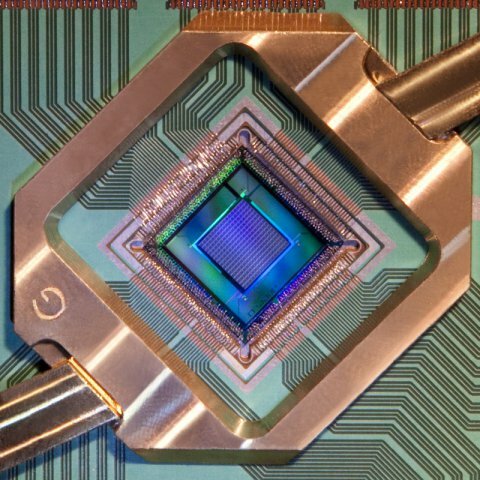 The goal is to build a quantum computer, develop quantum algorithms and to study how quantum mechanics influences modern computer science. The exercises will further deepen the knowledge learned during the lectures and will give first experiences on developping quantum algorithms. The course is intended for master students of computer science and related fields. Die Vorlesung richtet sich an Studenten der Informatik bzw. Medieninformatik (Diplom) nach dem Vordiplom sowie an Studenten der Informatik, Bioinformatik bzw. Medieninformatik (Master) im Rahmen der vertiefenden Themen der Informatik. Bachelorstudenten können im Falle von freien Plätzen teilnehmen, Masterstudenten werden aber bevorzugt behandelt. Für Vorlesung und Übung werden 6 ECTS-Punkte vergeben. All applicants for the course will receive an e-mail either if they are accepted or on the waiting list. Successful applicants will have to formally accept to attend the course and will be signed up for the final oral exam. Students who are signed up but do not show up at the course/exam will be reported with grade 5.0. There will be a waiting list. Students on the waiting list will be contacted after 24.09.2018 if we have additional room in the course. The course will be held as a blocked course from 08.10.2018 - 12.10.2018. Lecture: Oettingenstr. 67 Room 061. Exercise: Oettingenstr. 67 Room BU102. Exam (90 Minutes): 22.10.2018, 18:00, Oettingenstr. 67 BU101. Please be aware that the following schedule is preliminary and the individual session may be swapped (lectures and exercises). There will be an optional FAQ session on Thursday, 18.10.2018 16:00 c.t. in Room U151 at Oettingenstr. 67. KAYE, Phillip; LAFLAMME, Raymond; MOSCA, Michele. Über email bzw. nach den Übungen und Vorlesungen oder nach Vereinbarung.